Here are the current (Active) MLS listings in Buda's Coves of Cimarron neighborhood. Call me at (512) 913-1557 if you have a question, or want to view homes in the Coves of Cimarron. Neighborhood Location: The Buda subdivison Coves of Cimarron is located on the north side of FM-967 across from the Garlic Creek and Cullen Country neighborhoods. The main entrance is at Dove Dr. The community is west of the City of Buda. The table below gives a 8-year overview of Coves of Cimarron real estate market activity. Coves of Cimarron real estate market data is from the Austin Board of Realtors 1/1/2011-12/31/2018. Development of the Coves of Cimarron subdivision began around 1985. Construction of homes was completed in 2005. Homebuyers can choose from 1- and 2-story resale homes that have from around 1,600 sq. ft. of living space to over 3,400 sq. ft. Lot sizes in the Coves of Cimarron typically range in size from about 0.3 acres to 0.5 acres, meaning that you can enjoy some "space" with a home in this neighborhood. Several homes rest on larger lots up to 1 acre in size. Residents of the Coves of Cimarron can enjoy these community amenities: swimming pool, two tennis courts, walking trail and park with picnic facilities. 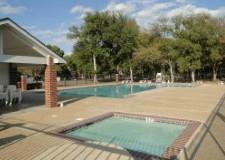 This community center area is located between Prickly Pear Pass and Treetop Way on the north side of the neighborhood. Residents of this subdivision live a short distance from Downtown Buda and its "old-town" charm. The city offers a number of public parks and a growing inventory of shopping and eating options along IH-35. Membership in the Coves of Cimarron HOA is a requirement. The total tax rate, which typically varies from year to year, was $2.24/$100 of assessed property value for the year 2017. The primary taxing authorities for the Coves of Cimarron are the Hays CISD and Hays County. Students living in the Coves of Cimarron subdivision learn in schools of the Hays Consolidated Independent School District. Parents or potential homebuyers should verify the currently assigned schools with the Hays CISD, since attendance zones are occasionally adjusted.